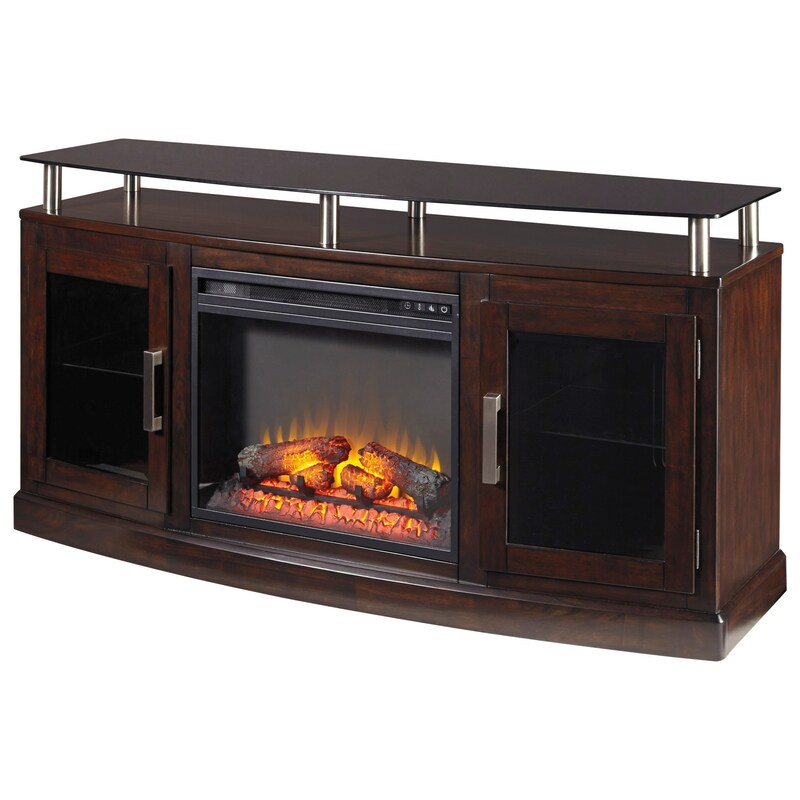 Accommodate your TV and electronics in contemporary style with this TV stand with a fireplace. It features a floating style black tempered glass top with metal posts to create bonus storage space. The arched front shape of the console complements two tempered glass doors with two shelves on each end. The fireplace insert has LED technology and a remote control with LED display. Its realistic wood burning flame effect combined with life-like logs creates an inviting atmosphere. It features two level temperature setting and a 20 watt high quality fan. The insert features a thermostat heating and overheating control device and a down light. Its flame operates with or without heat. The Chanceen TV Stand with Fireplace Insert & Floating Black Tempered Glass Top by Signature Design by Ashley at Sam Levitz Furniture in the Tucson, Oro Valley, Marana, Vail, and Green Valley, AZ area. Product availability may vary. Contact us for the most current availability on this product. Browse other items in the Chanceen collection from Sam Levitz Furniture in the Tucson, Oro Valley, Marana, Vail, and Green Valley, AZ area.